Elham Fanous is the leading Afghan pianist of his generation. His life’s work is to embody a positive face of Afghanistan’s future and to provide hope to musicians and artists living under threats to their creative expression all around the world. Elham has performed as a soloist on US State Department-sponsored appearances at the Kennedy Center in Washington DC and Carnegie Hall in New York City in 2013. He performed at the Library of Congress for the 2017 Anne Frank Awards Ceremony. He has also played for members of the diplomatic corps of Australia, China, Germany, Italy, and Korea. He has performed for former Afghan President Hamid Karzai and international dignitaries in Kabul and at the Afghan Embassy in Washington DC through the Embassy Series: Uniting People Through Music Diplomacy. His outreach performances in New York include solo recitals for Women for Afghan Women, NYU Forum on Law, Culture and Society, the Hebrew Home for the Aged in Riverdale, and Usdan Center for the Creative and Performing Arts. The 21-year-old Kabul native attends Hunter College Bachelor of Music Program in New York City on a full scholarship, thanks to the generosity of Hunter College supporters. Grants from the US Embassy in Kabul and the Prince Claus Foundation in The Netherlands have provided funds for his books and travel while at Hunter. Elham has been awarded full scholarships to participate in notable summer festivals including Classical Bridge (performances at Steinway Hall and Merkin Concert Hall), the International Keyboard Institute and Festival at Hunter College, the Chopin to Gorècki piano festival in Poland, and others. 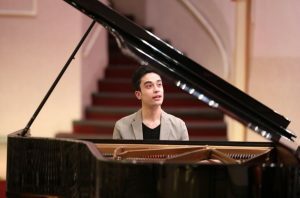 He was the 3rd prize winner in the Golden Key International Piano Competition in Frankfurt in 2012. He has also performed as a solo recitalist in Holland, Italy, and Poland. Prior to his arrival at Hunter College in 2015, Elham trained at the Afghanistan National Institute of Music (ANIM), studying piano performance, composition, and music theory as well as a full range of academic subjects. Supported by the World Bank, the US State Department and NATO, ANIM, founded by Polar Prize winner Dr. Ahmad Sarmast, is the first post-Taliban music school in the country, a place where boys and girls can study eastern and western musical traditions together. Elham also studied at the Franz Liszt Conservatory of Music in Weimar, Germany. Elham’s repertoire includes Bach, Beethoven, Liszt and Chopin, his specialty. He has also composed piano preludes, a piano sonata, and a new cadenza in the Afghan style for Mozart’s Piano Concerto No. 24. His compositions have been performed internationally and have received global media coverage, including in a TEDx Talk. Elham has been profiled on National Public Radio’s Morning Edition by host Renee Montagne and in the media in Britain and Pakistan. He is the subject of a German television documentary (ZDF tivi).